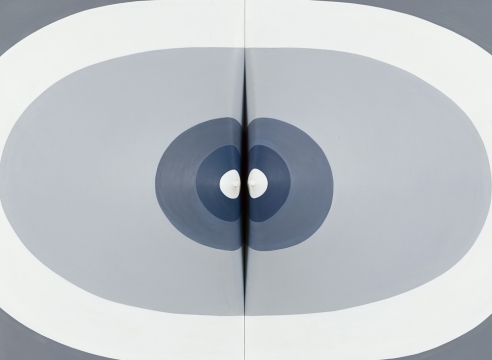 Sánchez’s sensually shaped canvases developed during the eight years she spent living in New York (1964-1972). Prior to this she worked in a number of styles, influenced by her travels and connections to European Post-War abstraction. Clear geometric forms, which are often repeated, swell out of Sánchez’s canvases. Her vocabulary is consistent, as seen in the span of works, some beginning in the 1960s and 1970s and continuing into the present. A centerpiece of the show will be a new, monumental diptych, Conversatorio (de la serie Eros y la Comunicación) [Conversation, of the Eros and Communication series], that demonstrates Sánchez’s continuing artistic development. Sánchez’s use of serial processes and a muted, reduced color palette connects her to Minimalism. Her personal language of sensuality and her embrace of the curve, however, creates a distinct approach to formal abstraction, unique among artists, which asks us to reexamine the tenets of Minimalism. Art historian Irene V. Small says: “The desire of the artist who, molding a work’s skeleton and then manipulating its tensile skin, treats it as a corpus, an organic entity with formal and emotive energies of its own. And the desire of the viewer, whose motility in relation to the canvas causes its abstracted shapes to expand, contract, slide, dilate, and bloom. Ranging in scale from the intimate to monumental, each painting compels the viewer to look at it from different angles as the waves and folds reveal themselves through a longer engagement. The paintings are often worked and reworked over the course of decades, orientations of panels are changed, and some are “tattooed” with the use of a fine black line, which indicates her biography. Time is approached in a non-linear way in Sánchez’s work, aligning with her position as a singular artist who has worked in relative obscurity, but engaging central contemporary issues. In conjunction with the exhibition a catalogue will be published with an essay by Irene V. Small, Assistant Professor of Art & Archaeology at Princeton University, with a Modern and Contemporary art and transnational focus. Archival images of Sánchez, works both included and not included in the exhibition, and a chronology of Sánchez written by Marimar Benítez, an esteemed art historian from Puerto Rico, will also add to the publication. Born in Havana, Cuba in 1926, Sánchez travelled between Europe, the United States and Cuba before settling in Puerto Rico in 1972. In addition to painting Sánchez designed the influential literary journal Zona Carga y Descarga from 1972-1975 and was a noted scenographer. Over the last three decades she has taught at the Escuela de Artes Plásticas de Puerto Rico. In 2013 Artists Space, New York, presented the first US survey of Sánchez’s work. In 2014 her work has been exhibited in the group exhibitions To Whom Does the World Belong?, El Museo del Barrio, New York, NY and Looking Back: The 8th White Columns Annual, White Columns, New York, NY. In June her work will be included in Arte Vida, a show curated by Adriano Pedrosa and Rodrigo Moura for the Centro Cultural Brasil.